It's the third largest county in England and yet, for many, Devon is a county that many people tow their caravans through to get to its southwestern counterpart, Cornwall. That's a great shame, because there's so much to see on caravan holidays in Devon. Visit Devon and you'll discover that it has some pretty spectacular countryside of its own and some spectacular beaches to rival those of its neighbour. Indeed, its countryside and coastline is so special that much of it is recognised as such. Here's the deal. The county boasts two national parks, so you can visit Dartmoor (entirely in Devon) and visit Exmoor (shared with Somerset). There are also five Areas of Outstanding Natural Beauty, granted the same protection as that of a National Park – the North Devon AONB, East Devon AONB, Blackdown Hills AONB (also in the east of the county), South Devon AONB and Tamar Valley AONB, on the border with Cornwall. Devon is also the home to a UNESCO Geopark, the smallest of just 90 in the world, recognising the fragile geological infrastructure of the ancient coastline around Brixham and Torquay, on the English Riviera. In north Devon is a UNESCO Biosphere Reserve, one of just three in the UK, demonstrating a balanced relationship between people and nature, plus there's a UNESCO World Heritage Site – the Jurassic Coast stretching from Budleigh Salterton in Devon to Poole in Dorset. 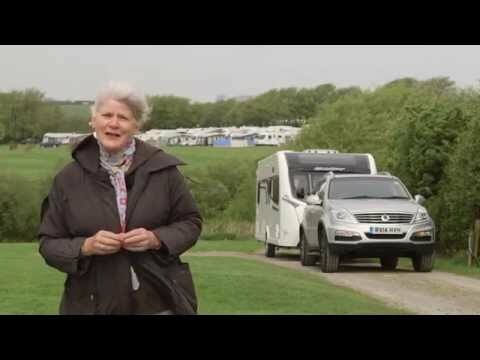 If you're unsure how to tell a Geopark from a Biosphere, there are other ways to explain why you should visit Devon for your caravan holidays. North Devon is plied with giant beaches like those at Croyde, Westward Ho!, Saunton Sands and Morte Bay, beloved by surfers. These are interspersed with craggy headlands that have made many a ship's captain nervous on a foggy night – at least according to myth and legend. A small slice of North Devon is made up by Exmoor National Park too, with the twin Victorian holiday resorts of Lynton and Lynmouth quaintly hugging the cliffs, linked by a cliff railway. There are some excellent campsites near Lynton and Lynmouth. South Devon's coastline is that of rugged cliff top walks, hidden coves and gorgeous, sandy beaches, smaller than those in the north, but nonetheless worthy of a bucket and spade – and a net for rockpooling. If you're looking for surfing holidays in South Devon, visit Bigbury and Salcombe, also a magnet for sailors with the thin-necked Kingsbridge Estuary. We'd advise you to select one of the campsites near Salcombe and pitch the caravan safely before exploring this area, also known as South Hams. The roads are blissfully narrow and best observed on two or four feet, or two wheels. To the west of South Hams lies Plymouth, a waterfront city with significant maritime connections, including that of Sir Francis Drake, who set sail from Plymouth to attack the Spanish Armada way back when (1588), but only after he'd finished his game of bowls on Plymouth Hoe! With the South Hams providing something of a nose jutting into the Atlantic, Devon's southeastern coastline – Torbay and the towns of Torquay, Paignton and Brixham – remains sheltered all year round and, consequently takes on the name of the English Riviera. Torbay has been popular since Victorian times – and still a very popular destination for caravan holidays as many of the campsites near Torbay have sweeping sea views. Visit Torbay to enjoy its microclimate, that means that it receives much milder weather in winter than other coastal areas, and palm-tree summers. But in the very heart of Devon is the mysteriously dramatic and striking Dartmoor. Filled with high tors, standing stones, bogland and hundreds of little streams running off its slopes to create the fertile farmland that Devon is otherwise so renowned for, Dartmoor's natural beauty never ceases to enthrall and amaze. Best of all, there are plenty of good caravan parks and campsites near Dartmoor. Visit Dartmoor and try your hand at Letterboxing, a popular treasure-hunt pastime on Dartmoor. Collect stamps along the way to fill your logbook and leave your own trace in the visitor's book. Or look out for the Dartmoor ponies and watch the 'pony drifts', where the animals are rounded up annually for a health check and foaling. Alternatively, go in search of film locations – Dartmoor was used as the location for Steven Spielberg's film, 'War Horse', in addition to being the setting for Conan Doyle's novel, 'Hound of the Baskervilles'. Go cycling in Devon. Hop on the saddle and take a leisurely traffic-free cycle ride along the whole or section of the 180-mile Tarka Trail, a figure of eight route based around Barnstaple and using old railway lines. Or cycle the Devon Coast to Coast cycle route from Ilfracombe to Plymouth. Try watersports in Devon. Explore the spectacular coastline of the UNESCO English Riviera Geopark on a group canoe trip, searching coves, looking at marine wildlife and geology. Other activities in the Geopark include coasteering, rock climbing, kayaking and kite surfing. Celebrate British maritime history. Follow the trail of Sir Francis Drake, one of England's most celebrated maritime heroes, by visiting his former home of Buckland Abbey, and various locations around Plymouth. Visit Agatha Christie's house and haunts. Follow the literary trail across Devon discovering the inspirations for more than twenty of her novels, take part in the annual Agatha Christie Festival on the English Riviera, walk the Agatha Christie Mile, visit her former home Greenway, where several of her thrillers were set and even be transported there by vintage bus from Torquay – but keep an eye on the passenger behind you! Much of Devon's activities revolve around the sea, although music and literature play a big part in the county's festivities, meaning there's plenty to do all year round on your caravan holiday, whatever your interests. June is the setting for Croyde's annual GoldCoast Oceanfest, celebrating music and watersports. In July and September, Plymouth celebrates the seas with, first, the Port of Plymouth Regatta and second, the Ocean City Festival linking its maritime heritage to the arts. August sees Sidmouth filling up for its annual Folk Week while the focus is on all things crab in the South Devon Crab Month. Torquay rounds off the summer in September with the Agatha Christie Festival, celebrating its associations with the crime writer. Finally, if you wish to witness the birth of new life, then Dartmoor is the place to visit between May and August, when most of the Dartmoor foals are born. Naturally, the most popular time to visit Devon is the school summer holidays when weekend roads can become heavily congested. All of Devon can be accessed using Exeter as a gateway, with the M5, junction 31 connecting with the A38 to South Devon, Plymouth and the southern areas of Dartmoor, the A380 towards the English Riviera and the A30 for the northern areas of Dartmoor. All of these sections of road are dual-carriageway, perfect if you're towing a caravan. From the east, the A303 linking to the A30 gives access to the east of Devon and the Jurassic Coast, in addition to connecting with the M5 at junction 29. This is a restricted junction, with access onto the M5 westbound only from the A30. For North Devon, use the A361 off the M5 junction 27. Parts of this are dual-carriageway, with many speed cameras. There can be traffic delays as the road funnels to a single-lane at Tiverton and also when crossing the River Taw at Barnstaple. The A39 (junction 24 on M5) to North Devon is not recommended for caravans, with steep hills at Porlock (1:4 – although a small, but twisty toll road avoiding the hill runs alongside), Countisbury (1:4) and Barbrook (1:4) – and its fair share of hairpin bends! That said, the A39 is one of the best roads for stunning views of the North Devon coastline and Exmoor when exploring by car without towing. Roads that run north to south in Devon – even the A-roads – are far from straight and often include steep hills, so if you're towing a caravan, you have been warned! Devon's minor roads are beautiful, but hedges are high and the lanes can be single-track, so campsites may have recommended arrival and departure times, so make sure you check prior to travel. Minor roads to the beaches are best avoided on Friday evenings and Sunday evenings, when possible.